"Rimu" redirects here. For other uses, see Rimu (disambiguation). Dacrydium cupressinum, commonly known as rimu, is a large evergreen coniferous tree endemic to the forests of New Zealand. It is a member of the southern conifer group, the podocarps. The former name "red pine" has fallen out of common use. 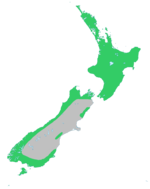 Rimu grows throughout New Zealand, in the North Island, South Island and Stewart Island/Rakiura. Although the largest concentration of trees is now found on the West Coast of the South Island, the biggest trees tend to be in mixed podocarp forest near Taupo (e.g., Pureora, Waihaha, and Whirinaki Forests). A typical North Island habitat is in the Hamilton Ecological District, where Fuscospora truncata and rimu form the overstory. Associate ferns on the forest floor are Blechnum discolor, Blechnum filiforme, Asplenium flaccidum and Hymenophyllum demissum. An 800-year-old rimu tree can be seen at the Otari-Wilton's Bush in Wellington. Rimu is a slow-growing tree, eventually attaining a height of up to 50 m, although most surviving large trees are 20 to 35 m tall. It typically appears as an emergent from mixed broadleaf temperate rainforest, although there are almost pure stands (especially on the west coast of the South Island). 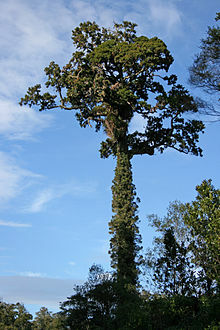 There are historical accounts of exceptionally tall trees, 61 m, from dense forest near National Park in the central North Island, now destroyed. Its lifespan is approximately 800 to 900 years. The straight trunk of the rimu is generally 1.5 m in diameter, but may be larger in old or very tall specimens. The leaves are spirally arranged, awl-shaped, up to 7 mm long on juvenile plants, and 1 mm wide; and 2 to 3 mm long on mature trees. It is dioecious, with male and female cones on separate trees; the seeds take 15 months to mature after pollination. The mature cones comprise a swollen red fleshy scale six to ten mm long bearing one (rarely two) apical seeds 4 mm long. The seeds are dispersed by birds which eat the fleshy scale and pass the seed on in their droppings; they are an important food resource for some species, particularly the kakapo, whose breeding cycle has been linked to cone production cycle of the tree. Historically, rimu and other native trees such as kauri, matai and totara were the main sources of wood for New Zealand, including furniture and house construction. However, many of New Zealand's original stands of rimu have been destroyed, and recent government policies forbid the felling of rimu in public forests, though allowing limited logging on private land. Pinus radiata has now replaced rimu in most industries, although rimu remains popular for the production of high quality wooden furniture. There is also limited recovery of stump and root wood, from trees felled many years before, for use in making bowls and other wood turned objects. The inner bark can also be used to treat burns and cuts. Although slow to establish, with a long juvenile period and fairly high moisture requirements, rimu is widely grown as an ornamental tree in New Zealand. It is attractive at all growth stages, usually quite narrow when young, then developing into a broader tree with weeping branches before finally progressing to its more upright adult form. While rimu does exhibit some variation in the wild, garden cultivars are largely unknown, except for one recent introduction, 'Charisma', which is a compact, golden-foliaged form. ^ Thomas, P. (2013). "Dacrydium cupressinum". The IUCN Red List of Threatened Species. IUCN. 2013: e.T42448A2981038. doi:10.2305/IUCN.UK.2013-1.RLTS.T42448A2981038.en. Retrieved 12 December 2017. ^ Wellington City Council. "Otari-Wilton's Bush brochure" (PDF). Wellington City Council. ^ a b c Salmon, J.T. (1993). The Native Trees of New Zealand. Auckland, New Zealand: Reed Books. pp. 74–79. ^ "Maori uses: Medicinal plants, Conifers". University of Auckland. Archived from the original on 15 October 2008. Retrieved 2008-10-12. "Dacrydium cupressinum". New Zealand Plant Conservation Network. Retrieved 2010-10-03. Wikimedia Commons has media related to Dacrydium cupressinum. This page was last edited on 24 February 2019, at 07:29 (UTC).